Lesson is a fragment from the book ” Virtual European Championships part 1″. The main point – Combine as many chances as possible. 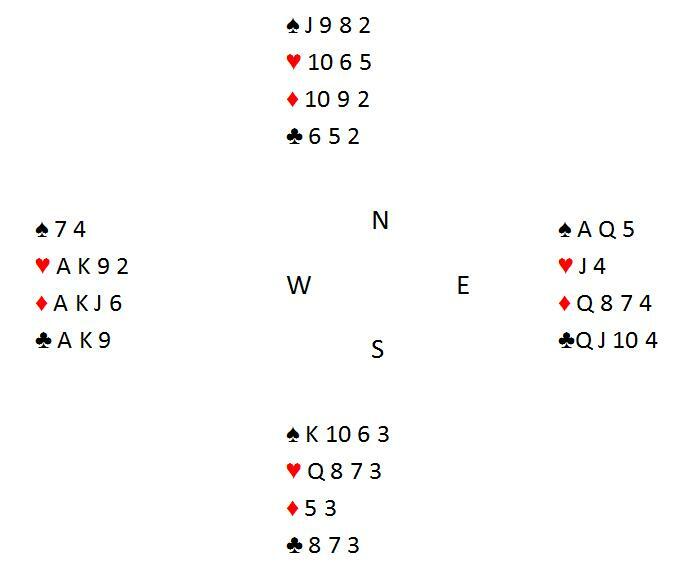 Win the diamond lead in the West hand and play ♥2 to the jack, hoping that North holds the queen. If South wins with the queen of hearts, win the return and cash two heart tricks in case the ♥10 drops. Finally, you will finesse the spade king or play for a heart-spade squeeze. The fall of the cards in the suits outside spades will often give you a clue as to which option to try. Closed Room – Contract 6♦, +920 for EW. You played well: +990 = +2 IMP. Wrong declarer’s play: –50 = –14 IMP.